The students have been doing research on a Great American. Today they will use Microsoft PowerPoint to create their Great American's project. The students are going to make a gift for their Adopted Grandparents from Dogwood Village. On one of their first visits of the school year, they asked their adopted grandparents a series of questions about their favorite things. They will take what they've learned and use Pixie to create a present. Click on the image below to see examples from last year. We started the class off by discussing how students save their work papers. Then we talked about how computers store information using storage devices such as a hard drive. Then I showed them the hard drive inside a computer. We talked about the importance of organizing things and how confusing it would be if you just threw all your papers in the bottom of your backpack. The same thing is true for the computer. You need to store the files in an organized way to make it easy to find it again. I had a "small paper filing cabinet" and explained that the computer uses a similar system. In my example, I had folders for each grade and then inside the second grade folder there was a folder for each student. I showed them how the computer was setup the same way. I showed them that computer folders could hold the same kind of things as a paper folder. We looked at some documents, listened to an MP3 song, watched a quick video, and looked at a photo. I used the "filing cabinet" and "folders" to demonstrate the difference between using "save"and "save as". The students learned that once you save a file and then start editing it again, you are working on a "copy" of the original. If you decide to "save" the file, then you are overwriting the original (in other words you are discarding the original and keeping the new version). But if you use "save as" and give the file a new name, then you are keeping the original file and keeping the current version. We finished by talking about the importance of saving files in their "personal folders". Their "personal folders" are stored on a "Network Server" in the mail room. If they store their files there, they can access them from any computer in the school. I showed them the network cable that connects each computer to the school "Local Area Network (or LAN)" and how the computer runs up the wall into the ceiling. That's how computers talk to each other. Here are the worksheets the students brought with them, but with their answers. Today students will learn that people use Spreadsheets to sort information. Then they will finish entering four of their word study words into a prepared Microsoft Excel spreadsheet. When they have all their words entered, they will learn to sort them. They will also learn to sort multiple columns of data by sorting compound words. In this activity, they will also learn how to navigate between different "worksheet pages". The students learned that spreadsheets are used for information that is laid out in tables. People use spreadsheets to sort, calculate, and graph. The students will learn 4 new vocabulary words – worksheet, column, row, and cell. We will also do an exercise where they will start Microsoft Excel, learn to navigate a spreadsheet, identify cells, and enter data. 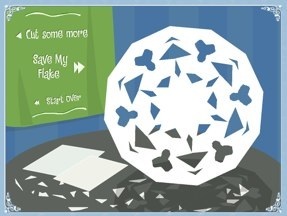 In celebration of winter, the students are going to design their own snowflakes using a free online tool. This is reminiscent of cutting out snowflakes from folded paper. This activity works on the students fine motor and mouse skills. It is always one of the students favorite computer activities! They will write a snowflake poem in the classroom to accompany their snowflakes. The 2nd graders are learning about Goods and Services in class and created fictitious businesses. In class they used a worksheet to design their own business cards. They created those business cards using Microsoft Word in computer class. I printed enough business cards so everyone had a copy of everyone else's business cards. They used them in class for different activities such as sorting businesses into "goods" and "services".